Eurostar is an international high speed service between Paris, London and Brussels, through the 50 km (31 mi) long Channel Tunnel, using TGV-derived trains. It is jointly operated by British Rail (European Passenger Services), SNCF (the French national railways) and SNCB (the Belgian national railways). Eurostar trainsets can operate at speeds of 300 km/h (186 mph) on the Nord-Europe line in northern France. To see where this is, take a look at the map. 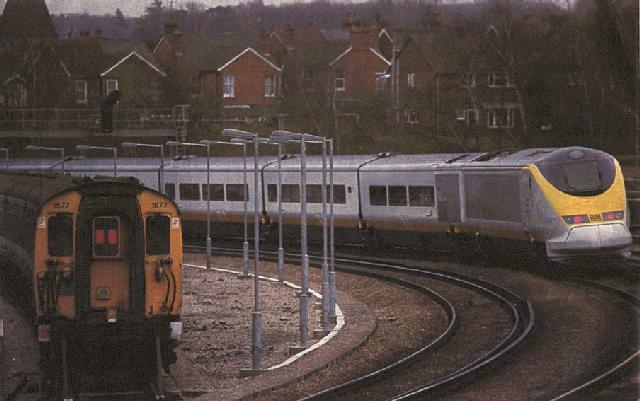 The photograph (from La Vie du Rail) shows a Eurostar rounding the Tonbridge curve in Britain. At left is an old Class 411 EMU. Eurostar owes its existence to the Channel Tunnel project, which fostered cooperation between France and Britain to establish rail service between Paris and London. Early on in the development of the tunnel project, BR and SNCF agreed with tunnel promoters to make use of a certain fraction of the tunnel's capacity. Belgium joined in with France and Britain, and the International Project Group (IPG) for Trans Manche Super Trains was formed in 1987. The group was put in charge of defining the requirements for an international high speed rail service. Fairly quickly, it became clear that TGV technology was well-suited for this purpose. The IPG was a model of international cooperation, as staff from three countries shared a single office, a common secreterial staff and filing system. The specifications of the new train were drastic, since they had to conform not only to the requirements of three different rail networks, but also to special issues of tunnel safety. Final specifications were settled upon in November 1988. A firm order to build 30 trainsets was placed with GEC-Alsthom in December 1989; a further 8 were later added to this order. Eurostar's debut was delayed by the controversy surrounding the time and budget overruns encountered during construction of the tunnel. Perhaps this was providential, since technical problems were encountered while the new trainsets were being tested on British rails. The archaic 750V third rail power supply that Eurostar uses in Britain caused electrical interference problems with the sensitive signalling system, causing the train shut itself down unexpectedly. The delay in the tunnel opening was used to fix these problems (described in more detail below), and in the summer of 1993 the first Eurostar trainset was run through the tunnel... at reduced speed, pulled by a diesel locomotive. This was a major milestone, since until then Eurostar had used the boat and the road to get to Britain for testing. Eurostar service was officially inaugurated on 14 November 1994, and service has since been expanded incrementally to many destinations. Spotting Features: yellow duckbill nose, low profile. Special Notes: International (40/40/20) cooperation between France, Britain and Belgium. Eurostar trainsets come in two kinds: long and short. 31 trainsets are long, with 18 trailers between two power units. The remaining 7 are short, with only 14 trailers. The short trainsets are for service north of London, to destinations such as Manchester and Glasgow, where platform lengths are insufficient to accomodate longer trains. For safety reasons, the trainset is divided into two symmetrical halves. Trailers R9 and R10 do not ride on a common truck; instead, they are coupled (not articulated) using an automatic coupler. This allows the trainset to be split in the middle in under two minutes, should there be a serious emergency in the Tunnel. This operation can also be performed at the level of the power cars, so that the train can be split in a total of three different places. In any case, no external intervention is required; the procedure is performed from inside the train. Should a trainset become stranded in the tunnel due to a power failure, the couplers at each end of the Eurostar trainset are compatible with Eurotunnel's diesel electric locomotives, as are the brake and service connections. Eurostar's nose is computer-optimized for running in the Channel Tunnel, where pressure waves can affect passenger comfort. The tunnel itself is passed at a reduced speed of 160 km/h (99 mph), and TVM 430 cab signal is used as on the high speed lines, but with non-permissive blocks. One of the main differences between Eurostar and its TGV brethren is the introduction of a British-designed asynchronous AC drive, as opposed to the synchronous drive used until then in TGV technology. A Eurostar trainset has twelve 1020 kW (1370 hp) traction motors. Eight of them are in the power units (frame mounted, as in TGV practice); the remaining four are in trailers R1 and R18 and equip the trucks immediately adjacent to the power units, just like for the TGV Sud-Est trainsets. The reason for this is the great length (and hence weight) of the trainset; more powered axles are needed to provide acceptable acceleration. Eurostar's power to weight ratio is still the worst in the TGV family. Each power unit is equipped with two pantographs: one suited for high speeds and 25 kV AC, and the other for running to Belgium under 3 kV DC. On high speed lines, both 25 kV pantographs (one on each end of the trainset) are used. This breaks with the earlier practice in TGV technology of feeding the front power unit from the rear through a 25 kV power cable running the length of the trainset's roof. The great distance between the two pantographs (compared to other TGV types) eliminates the need for this, since the disturbance caused in the catenary by the leading pantograph has enough time to damp out while the train passes underneath. Advantages are lower currents, and simplicity. The third rail pickup shoes, for 750 V operations on British soil, are found on each side of every powered truck. They number 12 total, and they retract when not needed to fit the UIC loading gauge. A design challenge was to mount them on the truck sideframes (instead of on the journal boxes, which allows a constant height to be maintained) in order to reduce unsprung mass. The former Southern Railway's third rail electrification, which Eurostar uses in Britain, uses a 50 Hz track circuit. The return traction current from the Eurostar trainsets also travels through the rails, so it is of the essence to avoid any dangerous interference between traction and signalling. The variable-frequency supplies used to run Eurostar's 3-phase AC asynchronous motors are liable to produce this frequency. This was recognized early, and Eurostar power units were built with an Interference Current Monitoring Unit (ICMU) which automatically opens the main circuit breaker as soon as the 50 Hz component is detected. In principle, this was to take care of the problem without excessively frequent circuit breaker trips. In practice, things turned out differently. As soon as Eurostar trainsets started testing in Britain, the ICMU's began tripping much more often than expected. Every time the ICMU cut power, it took approximately thirty seconds to restore it. This became a serious problem since the trips occured at intervals on the order of thirty seconds. Eurostar is already woefully underpowered when it uses third rail (it has about one quarter of its full power available, in order to limit current pickup to about 750 Amps per shoe) so frequent tripping made it impossible to keep an already slow schedule. Why were there so many ICMU trips? As it turns out, arcing between the pickup shoes and the rail was the problem. Eurostar's third rail pickup shoes are not linked through a 750 V power cable running the length of the train, so that when a break in contact occurs, the load cannot be taken over by as many other pickups. This results in bigger sparks, which can generate noise with a 50 Hz component detected by the ICMU. The solution to this problem was twofold: First, the modification of over 1000 track circuit relays to increase their response time, and then the modification of the ICMU's so that they only cut power when the 50 Hz component was detected for longer than 1 second. These modifications took care of the problem, but delayed the testing program and made a stink in the press. Eurostar is operated as a seamless service, which is something of a challenge because three countries, each with their own language, are served. In many ways, a trip on Eurostar will feel more like an airplane trip than a conventional train trip. There are airport-like check-in procedures; the staff wears specially designed uniforms and speaks several languages, and on-board announcements are made in up to four languages: French, English, German and Dutch. The language of the country in which the train finds itself is used first. Like the cabin staff, the driver is also required to speak several languages. Drivers can use their native tongue to communicate on the train's radio link to the dispatcher. Eurostar's information system is trilingual, so that the computer displays in the cab can be set to the driver's preference. Eurostar can acheive very high speeds, but only on the continent. The tracks in Britain are limited to 161 km/h (100 mph) because of the third rail supply and tight curves. This leads to a rather embarrassing disparity in average speeds on either side of the Channel: in a run from Paris to London, the average speed on the French side is a full 160 km/h (100 mph) faster than on the British side! The high speed rail link from the tunnel to London, the Union Railway, is planned to open in 2002, and will make the run significantly faster. 210 million FF (1988) This works out to approximately $40,000 per seat, possibly another world record for a train. (For comparison, a typical new airliner costs about $250,000 per seat.) The design lifetime of Eurostar is 30 years. These were written by people who actually rode Eurostar. ...of Eurostar can be found here in the TGVweb, or in the Mercurio Picture Gallery. Sources: La Vie du Rail, Railway Magazine, Eurostar Special (on-board magazine), and others. Thanks to Andrea Zana for suggesting some of these sources.